This is my second contribution to the Improv Challenge, a monthly party hosted by Frugal Antics. All the participants are required to use two assigned ingredients and come up with an original dish. This month's ingredients are: Tah-dah! Carrots and ginger. 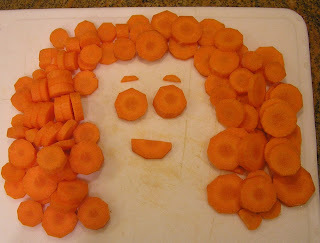 Carrots and ginger compliment each other very nicely ... never a bad word between them (they must be Canadian). So nicely, in fact, that I have two recipes using these very same items: Honeyed Carrots and Sweet and Spicy Carrot Bisque. But, according to the rules of the Improv Challenge, I can't recycle either of them (although there's no rule having links to them ... anarchy, anarchy! ).